Saturday May 19th 1883 I hurried through the work this morning and went to town as I was going to spend the day at Hatts with the Robinson girls. We had a pleasant visit. I came home before supper and worked on my edging all the evening. Jake Lamb came again tonight. 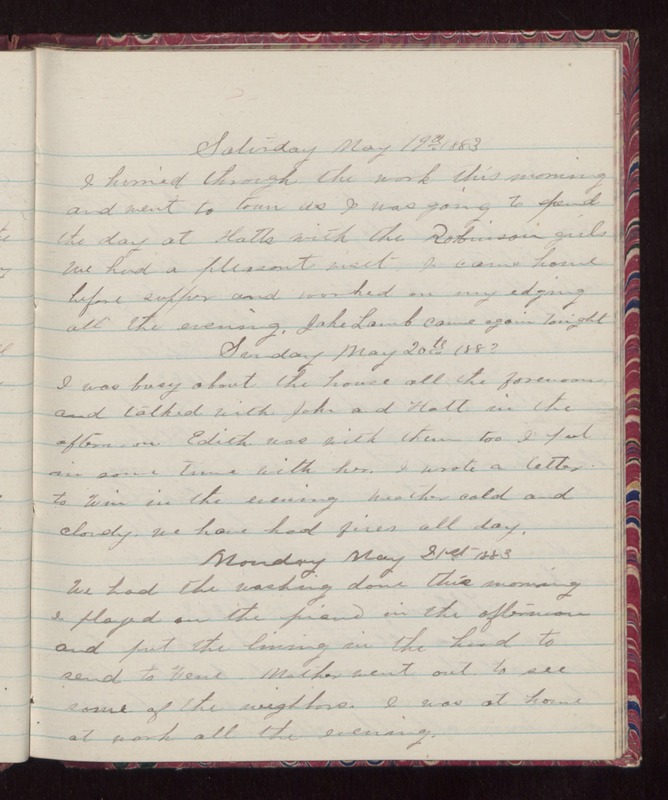 Sunday May 20th 1883 I was busy about the house all the forenoon and talked with John and Hatt in the afternoon Edith was with them too I put in some time with her. I wrote a letter to Win in the evening. Weather cold and cloudy. We have had fires all day. Monday May 21st 1883 We had the washing done this morning I played on the piano in the afternoon and put the lining in the hood to send to Vene. Mother went out to see some of the neighbors. I was at home at work all the evening.